CORVALLIS — The basketball world has done a "180" on Scott Rueck since he took over a woebegone Oregon State women's program in 2010. Then, Rueck couldn't get into the homes of the state's top recruits, let alone national-caliber prospects. Hard work and big-time results — a 140-34 overall record over the past five seasons, including 75-15 in Pac-12 action — has changed the paradigm for Beaver women's recruiting. With this year's team, Rueck welcomes sophomore point guard Destiny Slocum, a transfer from Maryland who was ESPN's No. 4 national recruit in the 2016 class; freshman center Andrea Aquino, ranked No. 7 nationally by ESPN in 2018; and freshman wing Jasmine Simmons of Australia, ranked No. 7 on ESPN's international list and No. 1 at shooting guard. On the horizon is prep senior Taylor Jones, a 6-3 four-star prospect from Forney, Texas, ranked as the nation's No. 28 recruit by ESPN and the first verbal commit of Rueck's 2019 class. Rueck's Beavers won three consecutive Pac-12 championships from 2014-17, reached the Final Four in 2016 and the Elite Eight in 2018 and have led the Pac-12 in overall home attendance four years running. Oregon State is playing host to an NCAA Tournament regional at Moda Center for the first time next March 29 and 31. The Beavers would like nothing better than to be taking part in that event; there is a very real possibility of that occurring. "It has been a process, and it has taken a lot of people to get it done," says Rueck, who begins his ninth season at the OSU helm against Cal Poly Nov. 9 at Gill Coliseum. "What our program has been about is having the courage to believe you can do these things and see it through. Hats off to our staff and our players to create a fan base like we have. This whole thing is special to be a part of." The Beavers pulled off signature victories over Baylor in the 2016 and '18 NCAA tournaments while ending Tennessee's 57-game NCAA Tournament home-court win streak last season. "The Baylor wins have opened doors for us because of the respect those two performances have commanded on a national scale," Rueck says. "Those wins have turned heads, to where there is an opportunity to talk to and have people listen from places that were not previously available to us." 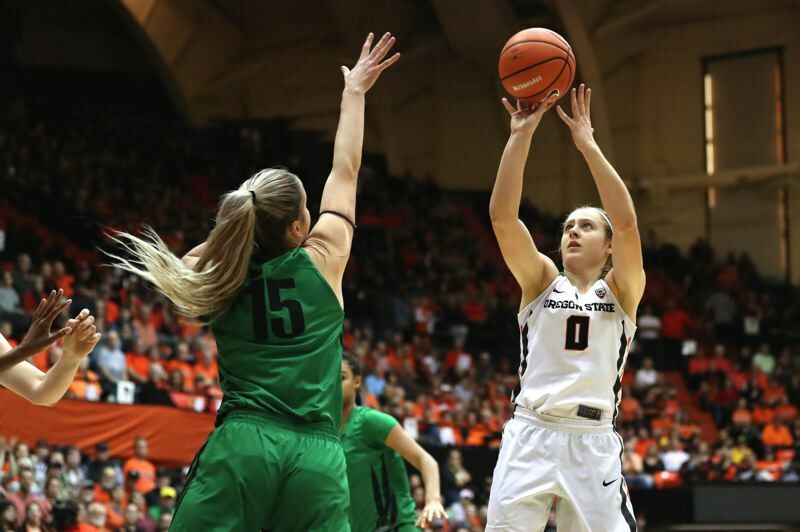 Oregon State began preparation for its 2018-19 season on Oct. 1 with everyone but All-America center Marie Gulich and reserve guard Taylor Kalmer back from its team of a year ago that went 26-8 overall and 14-4 in conference games. Gulich, the Pac-12 Defensive Player of the Year, is now in the WNBA; Kalmer has transferred to San Diego State. The 2017-18 Beavers led the nation in 3-point percentage (.404), were seventh in rebounding margin (9.7), and eighth in field-goal percentage (.481) and opponents' field goal percentage (.351). Those categories should be strengths again for a team featuring the deepest collection of perimeter talent in the Rueck era, including Slocum and returning starters Mikayla Pivec, Kat Tudor and Katie McWilliams along with key reserve Aleah Goodman. Oregon State also brings back starting power forward Taya Corosdale, reserve forwards Maddie Washington and Janessa Thropay, and 6-8 senior Joanna Grymek. "There is a great energy and vibe to the group," Rueck says. "There are high expectations coming off last year, with so many returnees. We have a big hole to fill in the middle, but there is a lot more experience with this team. "A year ago, we were teaching (players) how to compete, how to play the point guard position. Now we have four people on the roster who have played successfully at point guard. We're in a different place competitively, a more mature team with versatility and a whole bunch of weapons." The Beavers have been practicing without three of their players — Corosdale, who is rehabbing from offseason shoulder surgery, Tudor (hand) and Aquino with an injury Rueck declined to disclose. All three have been participating in some drills, however, and Rueck says he expects all to be ready for the season opener. Defense has always been Rueck's calling card, and the Beavers will have the size inside and athleticism outside to make that a strength again. They'll use the 3-point shot to their advantage — "we have everyone back, and we're adding Destiny," Rueck says — and he wants to score more in transition. "I know every coach says it, but I always want to run," he says. "You have to be able to. A year ago, with Mikayla at point guard, she had such an incredible ability to take the ball through the heart of the defense. Destiny is the same way. We have shooters who love to run the floor. "Now it's about getting our bigs to run like Marie. They don't need to be Marie; they just need to provide some of what she did in terms of putting pressure on the defense by getting up and down the floor." The team's greybeard is McWilliams, the 6-3 South Salem High grad and Oregon State's only fourth-year senior. McWilliams, who averaged 8.1 points while shooting .455 from the field and .438 from 3-point range a year ago, will likely start at small forward but could fill a variety of roles. "She is more aggressive now. That's something we've been asking for a long time. She has stood out as far as imposing her will as a scorer. She is seeing what we have seen all along. She has an incredible amount of talent. Katie is respected by her teammates as much as anybody I've ever coached." Another leader will be Pivec, the 6-foot junior who was OSU's second-best all-around player behind Gulich a year ago, averaging 11.1 points, 7.1 rebounds and 5.0 assists as the starting point guard. She'll slide over to shooting guard, and at times to small forward. "'Mik' is ready to take the next step in her game," Rueck says. "Her natural position is a wing, but she's so good attacking and so good in the open court. When she gets a rebound, we don't want her passing to anybody. We want her going to the rim." Goodman, a 5-9 sophomore from La Salle High, and Tudor, a 6-foot junior, are the team's best 3-point shooters and will both warrant extensive playing time. "It's nice to have Destiny able to play, and Leah has risen to the challenge," Rueck says. "Those two are really challenging each other already. Kat is going to play somewhere. I don't think there's a more competitive player in the gym than Kat Tudor." The 5-11 Simmons is athletic and a fine open-court player in the mold of McWilliams, but with all of Oregon State's backcourt talent, she could be a year away from making a major contribution. The 6-9 Aquino and 6-7 freshman Patricia Morris will battle Grymek for the starting pivot spot. Rueck on Grymek: "She went to (her native) Poland for six weeks ths summer. When she came back, she was in the best shape we've seen her. She's just in a great place right now, a completely different place than she was a year ago. I'm really pleased for Jo." On Morris: "Talk about somebody who learns every moment. You can just watch the growth. She is a hungry, highly intelligent athlete who has a great motor. She rebounds well and has a knack for finishing. She's a little bit ahead of schedule for what I anticipated." On Aquino: "She is very comfortable facing up. She handles the ball like a guard. She's that talented — an elite passer who can be a nightmare all over the floor out to 3-point range. I want to develop her back-to-the basket game. This kid needs to be an inside/outside threat." Rueck won't commit to a starting lineup. "I joked that maybe we'll just shoot (for the starting five) at shootaround," the OSU coach says. "I have no clue who will start. I don't choose that at this time of year. We'll see how our scrimmages and exhibition game (against Northwest Nazarene on Nov. 3) go, and then we'll figure it out. Good problem to have." Oregon State's nonconference schedule is a load. The Beavers will be in the Vancouver Showcase from Nov. 22-24 at Vancouver, British Columbia. OSU's opener is against Western Kentucky, which was 24-9 and lost to the Beavers in the first round of the NCAA Tournament last season. On the Beavers' side of the bracket in the eight-team tourney is South Carolina, which was 29-7 and lost to Connecticut in the Elite Eight last year. On the other side is defending NCAA champion Notre Dame, which went 35-3. "That's as good a tournament as you're going to find anywhere," Rueck says. For the third straight year, Oregon State will play host to the Maui Invitational Dec. 14-15, where the Beavers will face Texas A&M the second night. The Aggies, 26-10 a year ago, are led by sophomore guard Chennedy Carter, who averaged 22.7 points per game as a freshman. Oregon State also will play host to Duke — which went 24-9 and lost to UConn in the Sweet 16 last season — on Dec. 20 at Gill Coliseum. The Blue Devils beat the Beavers 72-65 last season in Durham, North Carolina. Like everyone else, Rueck has high expectations for the 2018-19 Beavers. "We have the ability to defend and rebound at the 5-spot," he says. "Our center position will resemble the way it was with Ruth (Hamblin) and Marie, which got us to the Final Four (in 2016). I love the potential of our perimeter play, with the experience, the ability to shoot the ball. "I know the character of this team. I know how hard they're going to work. I know they'll handle adversity well when it comes, and it will. They all came here to win big. I'm excited to see this year's puzzle get put together."